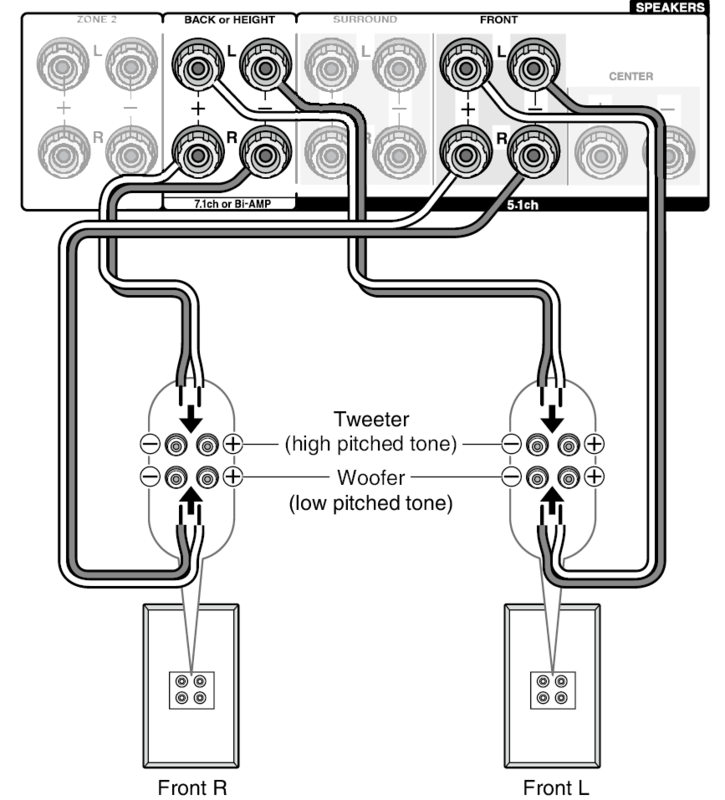 It is possible to connect speakers supporting bi-amping to improve quality of the low and high pitched ranges. Up to 5.2 ch will be played in bi-amping. 1.Connect as below using the FRONT terminals and BACK or HEIGHT terminals. 2.Turn the unit on and make the bi-amping setting. 1After pressing RCV, press HOME on the remote controller. 2With the cursors, select "Setup", and then press ENTER. 3With the cursors, select the order of "2. Speaker Setup" – "Speaker Settings" – "Front Speakers Type". 4Select "Bi-Amp" with the cursors and press ENTER. Before bi-amping, be sure to remove the short-circuit connector that connects the tweeter (high pitched tone) terminal and the woofer (low pitched tone) terminal. Use speakers supporting bi-amping only. For details, refer to the speakers' instruction manual. (C) Copyright 2014 Onkyo Corporation Japan. All rights reserved.